I've just been playing with the Sparkfun Venus GPS module. Very neat! It comes with more interfaces than you can shake a stick at, see the spec on the Sparkfun page. But I decided to use good old serial (or to be accurate the Software Serial library on the Arduino), so I just attached header pins to the RX0, TX0, 3.3V and GND connections and pushed it into some breadboard. Upload the following sketch to your Arduino BEFORE making any connections. 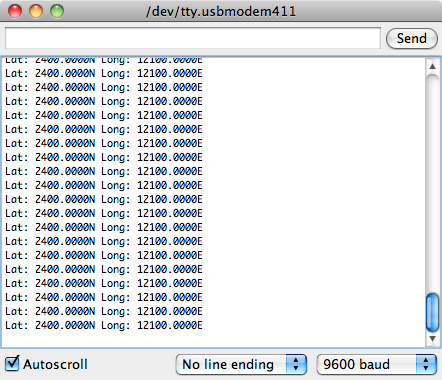 5V from an IO pin left high on the Arduino may well kill the 3.3V output from the Tx pin on the GPS module. Open the Serial Monitor and view your position! 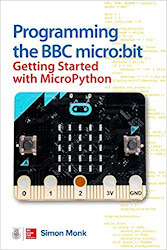 There is a really useful resource here, on the Arduino Playground, that tells you all about the various fields that your GPS unit is sending. Hi, is there any chance you can post a sketch where I can log all the information of gps to a sd card? Hi is any cjance you can tell me how to log the gps information to a sd card? I'm getting the same exact values of position (2400N/12100E) and i'm in Argentina! what could be the problem? I'm getting the same reads, but i'm in argentina! how to get speed in Km/h ? Hi! I am having the same issue as Juan Pablo Cellanes, I did the conection of VBAT and GND but the problem remains the same. I conected it to the same 3,3V line. Any help is welcome. Hello Guy i'm a electronic french student and in my project i would have the velocity in km/h how can i make this?? 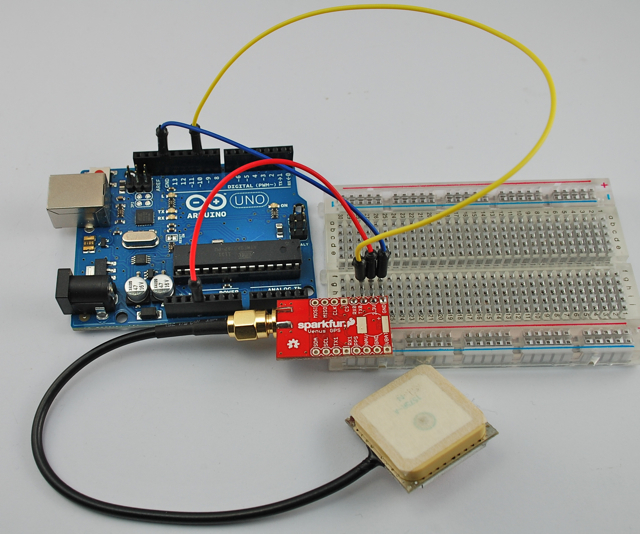 To log all info to an SD card, simply use the SD library on the Arduino instead of outputting it to the serial port. To get the velocity in km/hr, use the VTG output in the datasheet that Sparkfun lists on their site. The binary command set will tell you how to turn on the VTG output. *the GPS does not have a fix* - you must have an antenna and also be outside (or be able to see the sky) for the signal to reach the antenna. 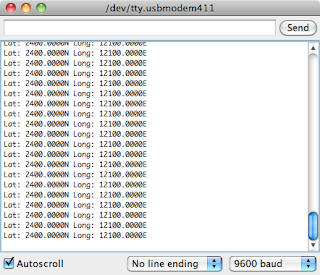 Hi, i did everything the same, but there is nothing on the serial monitor after i uploaded my program. Hi , i did everything the same, but there is nothing shown on my serial monitor. in my serial monitor(i tried to print the field) ,there are only "$GPGGA" instead of "$GPGGA,$GPGSA,$GPGSV,$GPRMC"
The rest of them are missing except for "$GPGGA". 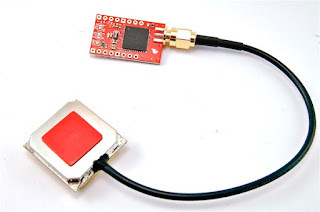 ​In this tutorial I find what I need to start interfacing the gps sensor with a SBC. And because I want to help many more hobbyists to start building robots, I share this tutorial on my post ​http://www.intorobotics.com/gps-sensors-tutorials-resources/. Thank you! Hi, this is a very good tutorial. I am getting the values. But, I can not plot those data realtime in google earth.Can you please help me , how to do that? Hi, this is a very good tutorial. I am getting the values but I have failed to plot those data real-time in google earth. Will you please help me to do that? I will be very grateful if you please help me. Again, thank you very much for the tutorial. Do you have some code to disable the Nav speed treshold? for low speed application (below 1km/uur). May I know what are the default states for the Search Engine mode and the Boot mode? Also, what is the difference between the Enhanced acquisition and Low power acquisition, is it only the consumption different?